The London tube map and all it’s stations, for me, works on an “eat, drink, ignore” basis. If a station has nothing interesting to eat or drink nearby, I largely ignore it. For a long time, Earls Court has been one of those vacant blips on my mental tube map, a place with not a great deal going on in terms of halal food, given that the majority of the interesting places seem to taper out by the time it gets to South Kensington. However, when informed on numerous occasions about Orjowan, a Lebanese restaurant a step away from the station that was well worth checking out, naturally, I became a little more intrigued. I’d probably be an incredibly easy victim to lure to a kidnapping, not that anyone would want to. (Unless they wanted a live specimen for a Shrek exhibition). All the meat here is halal. Alcohol is served. I visited Orjowan with Mrs. Bean, Fishwonger, Oniyon and Paanwala as part of a spontaneous lunchtime excursion following what was to thankfully be, our final summative examination of the year. A good student always excels at post-exam comfort eating. Excelling at the actual exam is a bonus. For starters, we ordered a helping of hummus and bread to share. The hummus was fairly thick, with a slightly grainy consistency, and possessed a strong essence of coriander with a subtle spice from the chilli powder that had been dusted on top. 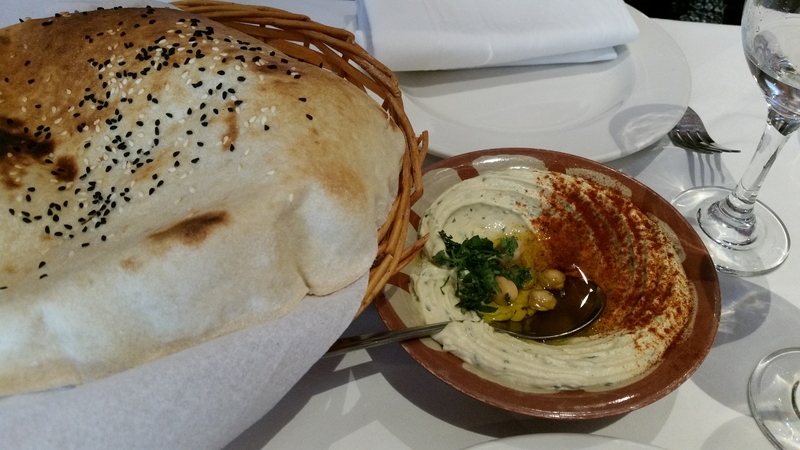 The accompanying bread was served hot and fresh, with a crusty and firm texture that remained soft, and combined well with the smoothness of the hummus. I was, as per usual, in the mood for animals, and lots of them, and so I was drawn to the option of a one man mixed grill. 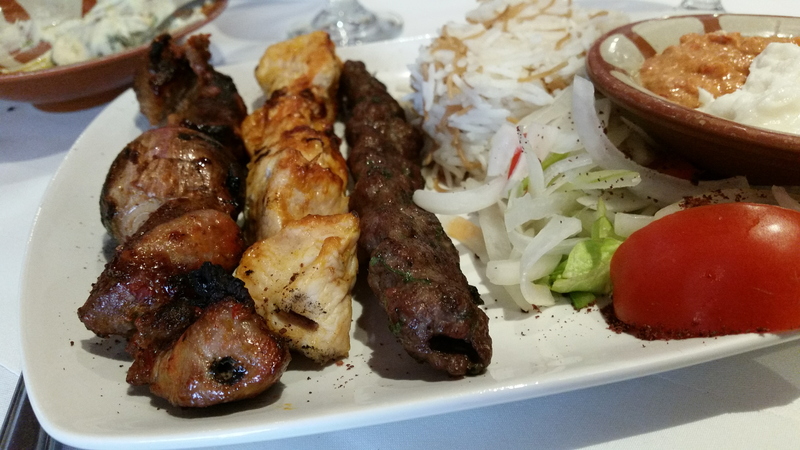 Sadly, whilst I expected a reasonable assortment of meat, I was greeted by three humble skewers, which made me a little uncertain as to whether it would satisfy my not-so-humble stomach. The lamb possessed a firm texture, but remained fairly soft and tender, and delivered a pleasant, meaty essence alongside it’s well-seasoned coating. The sheesh meanwhile was soft, tender, and strong in flavour, whilst the chicken was the weakest link of the three. Whilst it delivered a pleasant, clean flavour, some parts were well-cooked, and very soft, tender and moist, whilst others had been slightly overcooked, resulting in a firmer, dry centre. In fact, all of the meat, though of a good quality, was slightly dry, and the accompanying sauce didn’t really help, being slightly sour and not particularly appetising. As someone who is always full of rubbish anyway, the job of hoovering up leftovers usually comes to me, and this occasion was no different. Oniyon had ordered Orjowan’s baby chicken, which consisted of a soft, moist skin overlying a slightly drier body of chicken. Despite being slightly dry, the chicken was fairly soft and tender, and delivered a pleasant, well-seasoned, grilled flavour. I also managed to get my fork into Mrs Bean’s king prawns, which were well-cooked and covered in a strong, vibrant marinade with a predominant taste of tomato. Mrs. Bean rarely makes good decisions in her life, (hence the nickname), but those prawns were certainly one of them. As the others mentally edged towards the door, eager to find a place for dessert – so they could spend every morning the next week crying whilst on their bathroom scales – my attention was drawn to the lebanese coffee. My eyes twitched and my addiction took hold and I just had to order one before we left. I asked for no sugar and challenged the waiter to brew it as strongly as he could, as the others looked away in horror and repulsion at the powerful concoction that arrived as a result. It was a refreshing change, considering people usually look away in repulsion when I arrive at a dining table. 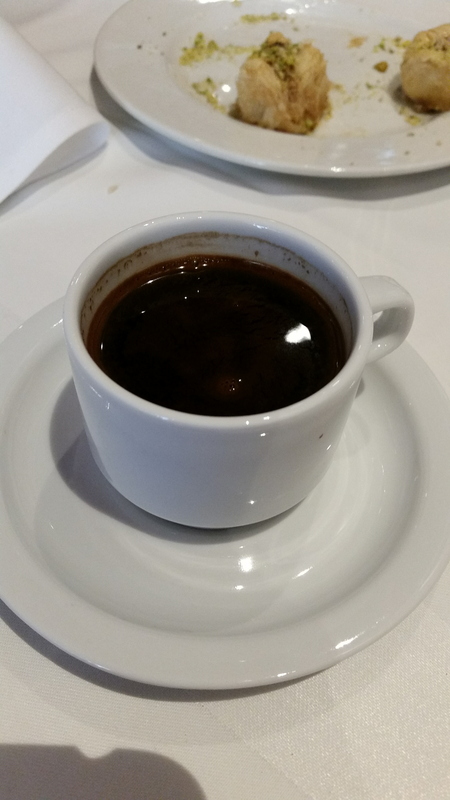 At the bottom of the cup, lay the thick and dense sediment I was expecting, covered by the dark nectar of goodness. The waiter had delivered well, as the brew was very strong indeed. The main body of the coffee was surprisingly very light in density, delivering a mild bitterness with each sip, alongside a strong aroma that was creamy and floral in nature. 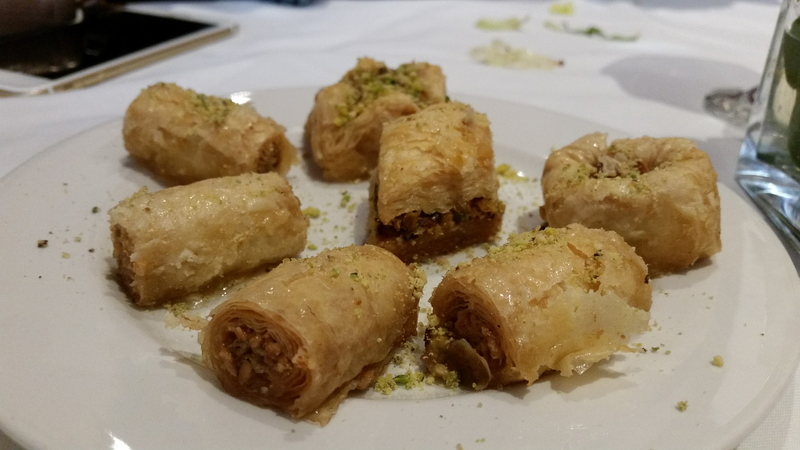 The kind waiter also treated us to a complementary plate of baklavas, which were fairly rich and sweet, and complemented my coffee well. My mixed grill amounted to £14, whilst my coffee cost around £3, and the hummus and bread cost £4.50. Starters generally cost around £5, mains around £12-£15, desserts around £5 and drinks around £3-£4. With or without location considered, I would say the main courses at Orjowan are a little pricey for what you get in return. My mixed grill consisted of only three small skewers, and it wasn’t a particularly exciting dish either to warrant the price. Portions are reasonable, but very much sit on the small side, and this especially includes the drinks and milkshakes, which are served in particularly small glasses for their £3 – £4 labels. Whilst the prices themselves aren’t particularly high at all, much more substance is needed in the dishes, either in volume or presence. Also, be aware that certain prices on the online menu seem to have not been updated (i.e the mixed grill which is listed as £12), and may be a few pounds higher in the actual restaurant. Our waiter was very friendly and welcoming. The small size of the restaurant (and the fact we were the only people there, save one other gentleman), meant that we received near enough his full attention throughout our visit. Perfect if you’re riddled with abandonment issues and attention-seeking tendencies like myself. I mean, why do you think I have a blog? As mentioned, Orjowan is quite a small restaurant with a simple, fairly modern decor, (which could do with a little sprucing up here and there), with comfortable leather chairs and wooden tables, and several ornaments and paintings spread throughout.The seating situation is a little cramped overall, but, like an asian family of seven armed with nothing but a nissan micra, Orjowan does well to make the most of the little space that it has. The restaurant itself is a quick two minute walk from Earls Court station. Parking spaces do exist nearby, but it may be quite difficult to find any that are free. Orjowan provides a calm and cosy ambience, which is easy to enjoy and relax into. Lebanese music fills the air in the background, occasionally drowning out the drivel of your dining companions, and there’s no sense of urgency for you to leave. Orjowan carries a strong reputation as a great lebanese eatery, and as such, my preliminary expectations of it were quite high. With a menu that seems to be a little hit and miss, (the mixed grill being a definitive miss), my first experience fell slightly short of those expectations, save for the service, the ambience, and the great brew of coffee. Orjowan very much sits on the line of the average for me, and whilst I would be willing to return myself to give it another go, (given that others have spoken highly of a number of their other dishes), it sadly, does not stir up enough excitement for me to recommend it to others. But keep your eyes peeled and your ears open, should they find their way into my affections in the near future.